Get a 1/10 scale Phoenix Wright figure. 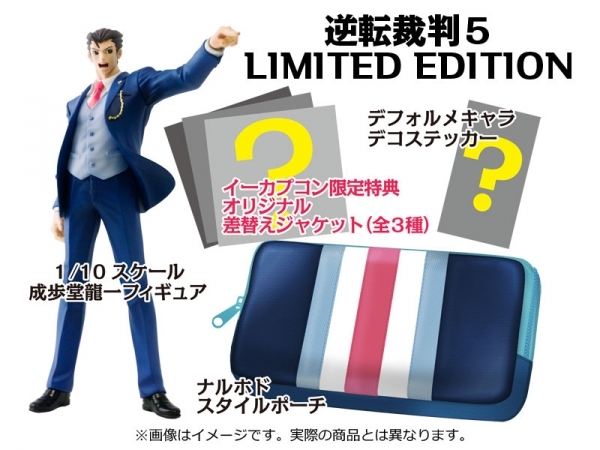 Capcom has revealed the e-Capcom special editions for the Japanese version of Ace Attorney 5, due out for 3DS on July 25. The publisher also shared screenshots of the three pre-order bonus costumes for Phoenix, Apollo, and Kokone detailed earlier this week. See the outfits, final box art, new character Yugami, and more shots of the limited edition at the gallery.